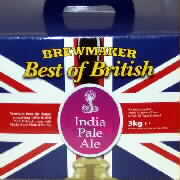 Brewmaker Best of British 3 kg Beer Kits offer you the quality and taste, associated with real ales from traditional breweries. Best of British contain 100% boiled malt extract made from only the finest quality malted barley and water. A special blend of malted barley is used dependent on the beer. English 2 row Maris Otter, with its strong reputation for producing the finest quality ales, is widely used in the range for its subtle sweet, unspoilt flavour. .